Born in the late 90s, I am considered to be a millennial. Why do I say this? 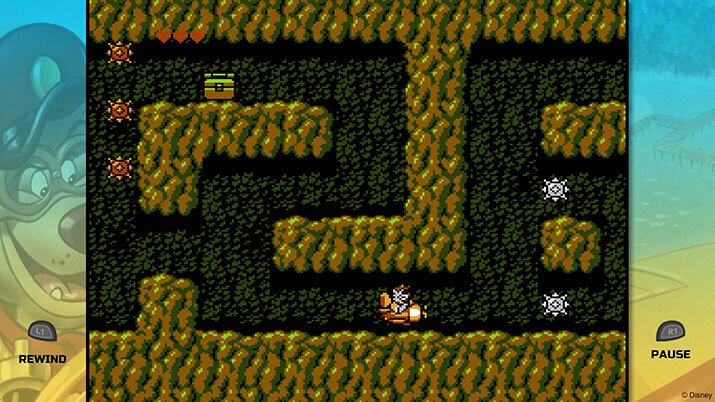 The titles included in The Disney Afternoon Collection (Ducktales, Chip ‘n Dale Rescue Rangers, Talespin, Darkwing Duck, Ducktales 2, Chip ‘n Dale Rescue Rangers 2) were originally released for the Nintendo Entertainment System in the late 80s and early 90s, based off their television show counterparts from the same time period. This is important to note because I have no nostalgic connection to either the television shows or the games they spawned. The Disney Afternoon Collection was developed by Capcom and Digital Eclipse and published by Capcom. As previously stated, it includes 6 classic titles from the NES era, along with many extra features to bolster your gaming experience. Being that this is a compilation, I’ll refrain from reviewing each individual title and rather focus on the additions made for this specific collection, and whether those are incentive enough to purchase the Disney Afternoon Collection. For those who haven’t had the pleasure to play these classic gems, rest assured, they are all fun, with plenty of variety, ranging from pogo-sticking and collecting treasure as Scrooge McDuck in Ducktales, to fighting against criminals as Darkwing Duck in Darkwing Duck, or flying around in a plane as Baloo in Talespin. Each title has improved visuals, with popping colors in 1080p, however, for players wanting a more retro look, there are filters available to make the screen resemble an older TV or computer monitor. Another feature while playing is a “rewind” button. You can press this at any time to rewind the action onscreen in case you made a mistake, such as missing a jump or getting hit by an enemy. This is to help contemporary players have more accessibility when playing these older titles, which are renowned for their somewhat unfair difficulty at times. It’s important to note that, though you can use it at any time, the rewind button is best used only occasionally. Using it too frequently or for too long will cause your gameplay to lag or even cause some character sprites to glitch. In addition to rewinding, players can also save their game any time while playing, and load it later. Each title has its own separate individual save file, so you can’t have multiple saves for the same game. Aside from their main gameplay, each title also has a Time Attack and Boss Rush mode. After completing one of these modes, your time will be recorded and compared against other online players. This is a great idea, because it gives players who have finished each base game something else to do, and put the skills they have acquired to the test. These modes, of course, restrict the use of the rewind feature. Complementing the games themselves, The Disney Afternoon Collection also has a museum section, where you can listen to every song in each title’s soundtrack and view original concept art made during the development of each game. The history is both interesting and educational, however, every aspect is already available as soon as you start playing, unlike many other titles with a similar museum section. It’s all opinion-based as to which way is better -- to have these features unlocked already or not -- but the advantage to locking certain songs or artwork is that it encourages players to play a certain game or play it a certain way, especially since every player will have their own favorite title they prefer over the others. The biggest problem I encountered while playing The Disney Afternoon Collection was, surprisingly enough, the sound. The main menu’s music just blasts so loudly as soon as you boot up the game, and there is no option in the menu to change the volume or mute it. It’s not just the main menus, either. While playing each game, you can pause and change things, like button configuration or the filter for your screen, but again, there’s no sound options; so, if you don’t like the in-game music, or would like to lower the volume, you’ll have to change your actual computer’s sound settings. This becomes inconvenient for players who like to have other music or audio playing in the background while they play. It would be nice to have the option. The Disney Afternoon Collection is well polished, and a solid collection piece. Each title is ported over well, with tight controls and fluid responsiveness, but there’s also plenty of extra features to enhance gameplay. For those who have been interested in playing any of the titles included or want to replay them on a newer system, this is a strong choice for you.